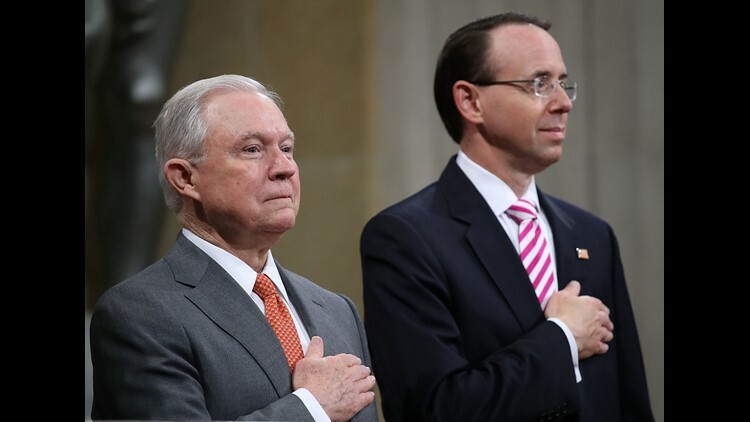 Attorney General Jeff Sessions (L) and Deputy Attorney General Rod Rosenstein (R) attend the Religious Liberty Summit at the Department of Justice July 30, 2018 in Washington, D.C.
WASHINGTON – Attorney General Jeff Sessions Monday designated the violent gang MS-13 as posing the most serious threat of any transnational crime group, surpassing drug cartels and the terrorist group Lebanese Hezbollah. Sessions, who has targeted MS-13 as part of the Trump administration's crackdown on violent crime, said the government's enforcement efforts would be consolidated under a new working group known as the Transnational Organized Crime Task Force. The new unit will be led by Deputy Attorney General Rod Rosenstein, who described the groups as a "scourge" that continues to reach deeper into American communities. In addition to MS-13, Sessions designated three drug trafficking organizations, including the Sinaloa Cartel, and the terrorist group Lebanese Hezbollah as the top five threats. "They sow violence and sell poisonous drugs," Rosenstein said Monday. "They bribe public officials and fuel corruption. They terrorize law-abiding citizens. And they are increasingly smart about how they commit their crimes. They use the financial system and modern technology – cell phones, social media, encryption, and other tools – in support of their illicit activities." The new crime unit has been ordered to submit an enforcement strategy within 90 days.